Spire, formerly known as “Alagasco,” is Alabama’s major gas utility—and its aging infrastructure (particularly old, leaky pipes) is releasing natural gas, or methane, into Alabama’s air. Ratepayers are covering the cost of the lost gas—which also poses a serious climate challenge. Methane is a potent greenhouse gas that is over 80 times more powerful than carbon dioxide in the short-term. Make sure they get there: Take action today, and tell the Alabama Public Service Commission to curb natural gas leaks. As an Alabama resident, I'm writing in support of your progress in reducing gas leaks from natural gas pipelines in Alabama. Now it's time to build on these steps. Working with Google Earth Outreach and Colorado State University, Environmental Defense Fund (EDF) recently used advanced leak detection technology and quantification methods to map and measure over 168 leaks in Spire's Birmingham territory. This is only a small fraction of the more than 2,000 outstanding leaks reported across various utilities in Alabama in 2016. Utilities can begin to address their leak backlogs and leak-prone pipe inventories more efficiently by working with the Alabama Public Service Commission to quickly replace the outdated pipe sooner than later. Not only are these leaks a waste of ratepayer resources, they are also an important environmental concern. Methane, the main ingredient natural gas, is a potent greenhouse gas. Utilities in our state should be required to use the latest technologies to find and measure leaks, so that they can better prioritize repair and replacement efforts. That means immediately fixing leaks that present a safety threat, then tackling those that leak the most. 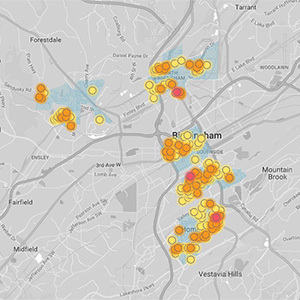 Across the country, many utilities are publishing dynamic maps of their natural gas leaks. I urge you to require Alabama utilities to follow suit, so the public can see where there's still work to be done. Finally, Alabama utilities should look for leaks more often, so they can fix them faster. This will benefit both customers and the environment, and can reduce the need for expensive emergency repairs. Please consider implementing these measures as soon as possible to protect both our environment and ratepayers.